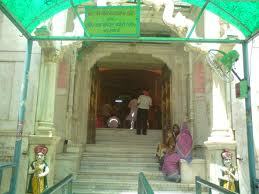 Here is Some information about Khatu Shyamji Temple in Khatushyamji Sikar Rajasthan India. 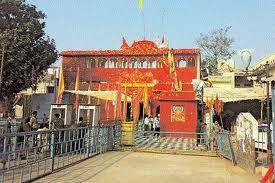 Khatushyamji Temple is located in the Khatushyamji Village, which is 65 km away from Sikar. This ancient white marble temple is dedicated to the Hindu deity Lord Krishna and is associated with several interesting legends. The temple is mentioned in the great epic 'the Mahabharata'. 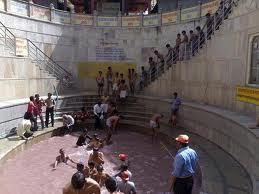 A dip in the pond located in the temple is considered holy by the Hindus. The Shyam Garden of the temple attracts tourists with its charming landscape. 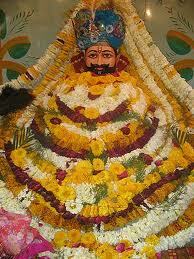 Khatu Shyamji and his gift of nature as are the center of everyone's devotion. The son of Bhima's son Ghatotkacha and Nag Kanya Ahilwati valor and courage are famous for Berbrik he was a great warrior. As a modern incarnation of Lord Sri Krishna is seated in Khatu here. Khatu Shyamji is considered to support the losers. It is called by many names Berbrik Khatu Shyam, Shyam government, Suryawarcha, Suhriday, shisha donor, three Bandhari, Khatu Naresh and are known by such names as the embodiment of evil. 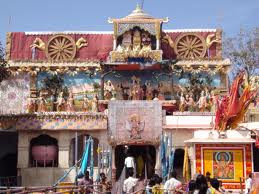 Khatu Shyam temple is also a major center for faith Mtavlmbion Sanatana Dharma. India's corner - corner people keep coming to the temple. 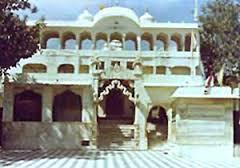 Khatu Shyam temple is worshiped as a hero Berbrik black because the time of the Mahabharata war, Krishna blessed Berbrik valor and their sacrifice was as white as the name of Kali Krishna Berbrik time will worship. Hence the reason in Khatu Shyam Shyam Temple Shisha Berbrik ie the worship of nature legislation. Ringus near the same spot as his body is worshiped. 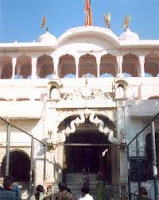 Khatu not prevalent in the establishment of which has been the subject of Khatu Shyamji's head was placed in the Khatu Shyamji temple was built on the present. This place is called a cow milk was shedding a torrent of people see this, then head of the excavation appeared. For some time that a Brahmin was given to the king of Khatu shisha place in the dream he had ordered the temple built at the site of the temple of the Holy on the day of Karthik She ekadashi The temple was adorned. 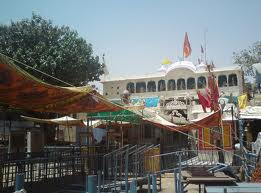 Khatu Shyam temple is the center of faith of the faithful, thousands of devotees visit here throughout the year to put the lives of many devotees walk to the philosophy of this holy place to come by. So many pilgrims arrive to worship the black temple. 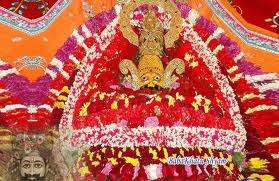 Khatu Shyamji temple fair has grown in bright fortnight in the month of Falgun and corner of the country - Views from the corner to reach here on this auspicious occasion. Applicable to the ninth Dwadshi this fair is very important. Views Sundays and eleventh time in the temple can be seen from the large number of devotees. Recognition of people come here to get the vision of Shyamji get salvation of all life and all the pain go away desires are fulfilled. Only then called "losers Khatu Shyamji support us"
By Air:Nearest airport is Jaipur which is 80 kms from Khatu Shyamji. One can board a cab or a bus to reach the desired destination. By Rail:Nearest railway station is Reengus. All the trains running on Delhi route passes through Reengus. One has to take Taxi, Jeeps etc. for reaching Khatu Shyamji. Daily bus services from Delhi - Khatu - Delhi, are operated by DTC, Haryana Roadways and Rajasthan Roadways.